Wet Basement: A Reader Question - Armchair Builder :: Blog :: Build, renovate, & repair your own home. Save money as an owner builder.- Armchair Builder :: Blog :: Build, renovate, & repair your own home. Save money as an owner builder. lines going down the cement, as if water had been running down recently. A couple of weeks later, during the fast thaw of much of the snow (and we had a lot of snow), we had a basement window well fill up with water and lots of water streaming in through the window. Interestingly, during this entire time, the sump pump never came on even one time! The contractor came by today and said that he would have extra dirt moved up near the foundation of the home. There is a significant slant to our property (on the side of a hill). We were wondering what your thoughts are regarding the cause of these problems. Do you think that moving dirt out there will correct the problem(s)? Your input will be sincerely appreciated. Hi Terry. Congratulation on the new home! It’s hard to say for sure what is going without seeing the home, but I have a couple ideas that might ease your concerns. First, if you closed on the home in the later part of last year, I’m guessing your landscaping probably isn’t done yet…I know it gets cold pretty early in the fall in Wisconsin! Even if it did get completed, you probably are getting some settling up next to the foundation. So, if the builder is saying they need to put some dirt up next to the home, it sounds like the area next to the foundation is settling, we call this the over-dig area, as the 7-8 feet of backfill next to the foundation wall consolidates. This will continue to settle and will slow after the first year. 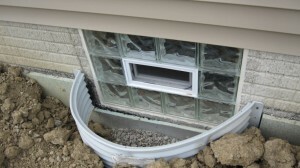 When this area settles, it creates a pocket for water to sit in when the snow melts or when it rains (similar to the window well). This water can then make its way through the foundation and drip down the wall. The solution to this is to get the lot graded once weather permits and make sure you have 6″ of fall for the first ten feet surrounding your home and a minimum of 8 inches between the top of foundation wall and the finished grade. This setup will take any water away from the foundation and basement at the ground surface. The other thing you might be experiencing is moisture coming from the new concrete in the foundation wall. When you install blanket insulation up against the new concrete wall, it traps the moisture that is coming out of the “wet” concrete. New concrete has a lot of moisture in it…which is released as the concrete hydrates (a.k.a. hardens). 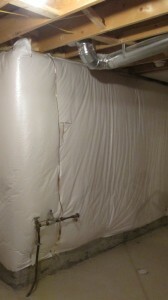 This moisture release from the foundation wall will decrease over time as the wall dries out. So, based on your description, I don’t think you have a major problem…just a temporary one. Let me know if you have further questions. p.s. You might want to leave the wet insulation off and open to dry until they can get the grading finished. In addition, make sure your window well drain is clear of any debris…leaves, dirt,…etc. Also, make sure you have a minimum of 8 inches between the top of your foundation wall and the finished grade.